Edited by Miami64 on 02-05-19 08:35 PM. Reason for edit: No reason given. Might as well replace all four. I agree with replacing all 4, however, I hope that you took pictures of the orientation of the hoses, because it will make it a lot easier to install the new hoses. I went through this problem when the shop that did the R&R of my engine, didn't take pictures, and when it came time to put the new hoses on, it was a guessing game to getting them oriented correctly, so there was no interference with any other part of the car. I bought my hoses from Shafer's Classic Reproduction. If you are ordering hoses, you might as well check all the other wear parts, and order them all at once. The one part that I forgot was the tube that goes through the manifold, and it would have been easy to replace it while the engine was out. Luckily, mine hadn't failed, but I did need both the upper and lower choke heat tubes. The pictures of the set of 4 hoses from Classic Industries show the wrong hoses. The two long hoses must have 3 metal molded ends to match your originals. 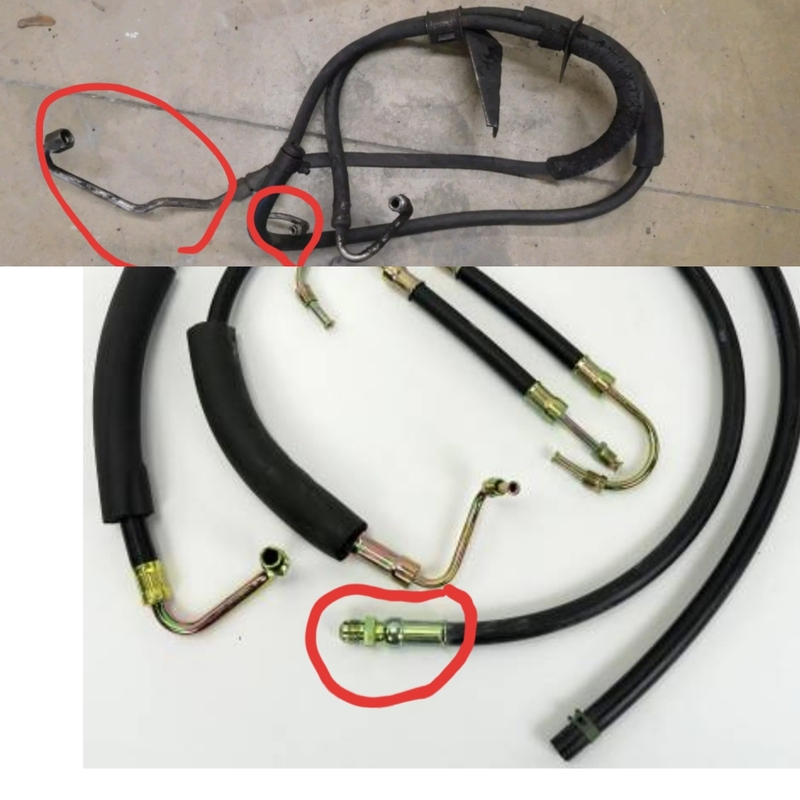 Also your old hoses (your picture) are clearly original, they are over 50 years old, replace all of them. I agree with a Junky, buy Schafer Classic Components ( part # PSH 401), these are quality hoses and they fit(cost is about $ 110 to $115) Find that brand of hoses if they do not sell that brand don’t buy them. I/we recommend what works for hoses from our experience in restorations. I have pictures of the hose routing and orientation if needed. I would like to see the pictures to make sure that I have the proper routing. The book shows exactly how the hoses are routed, if followed verbatim, there will be no problem. BTW - I am working in Miami now - took me 3 weeks to quit driving my 61 daily after moving here last July. I've done that job before, may be able to assist. Edited by omarine on 02-06-19 02:07 PM. Reason for edit: No reason given. 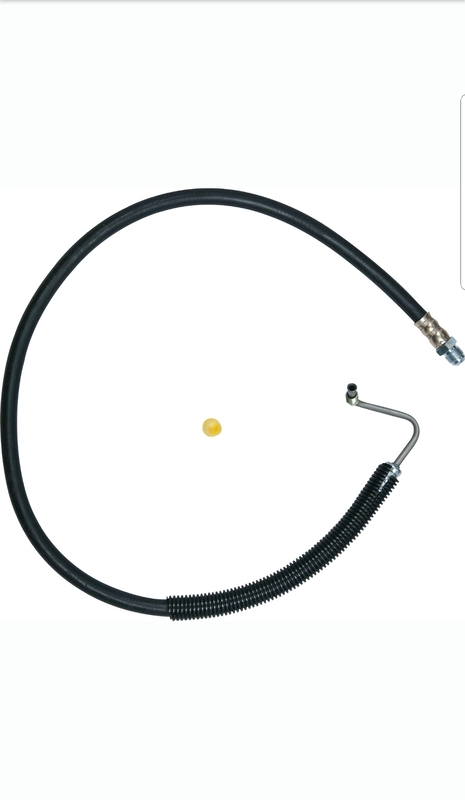 this requires an original PS pump with a metal pipe off the back of the pump to connect like the factory connected the hose. 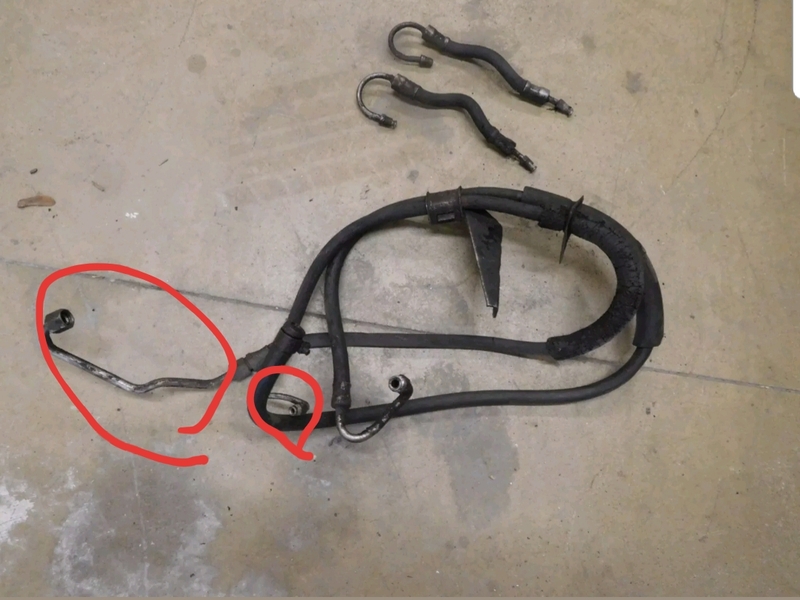 You circled the multi curved metal pipe, that pipe "stays connected to the rear of your Power Steering pump"(as I noted in the my previous post). See the first picture above. The two curved metal ends on large PS hoses go to the top of the control valve(these connections are also shown in the assembly manual). They only fit one way because of the size of the connections. You will need to make sure they "do not bind or hit each other" when turning the steering wheel (to test fit the connections to the top of the control valve). Test for fit by turning the steering wheel all the way to the right and all the way to the left. The power steering hoses lay on the stabilizer bar. Original PS cars had a protective plastic cover (about 1 ft long)surrounding the stabilizer bar to stop wear on the two large hoses. Thank You for the great photo's. I did install mine correctly but I have not installed the pump lines so your photo helped on those also.